Five will get you ten (wins). It just keeps getting better. The first win got the monkey off our back. The second and third wins accomplished something we had not done since 1968-1970, and the fourth matched a streak from 1951-1954. I’ve followed this rivalry since about 1980, and I never thought I’d see five in a row in favor of the Gamecocks. But here we are, completely in the heads of everyone who wears orange and purple, and believing six, seven and eight is not outside the realm of possibility. They trot out tired old scores and records – “my grandkids’ grandkids will never see this rivalry even tied!” They trot those out because they’re all the Clemsonites have left. And I think they’re finally beginning to realize we really don’t care about the all-time record, or a blowout that took place more than ten years ago. And it’s killing them. Until they can break this streak, nothing else really matters. Amen? Can I get a high five? Team Shaw. You know how we feel about Connor Shaw, so we won’t go into that again. But last night’s performance was indicative of what he means to us. He was sharp throwing the ball early, but when the run game kept getting continuously stuffed, Steve Spurrier called his number on the ground 22 times (including a couple of kneel downs) and #14 responded with nearly 100 yards. He simply did what he had to do to get us the win, something he did 17 times against no losses at Williams-Brice Stadium. If you know anything about the history of South Carolina, that’s a remarkable number. But Shaw has been a remarkable player, as Coach Spurrier summed up nicely. Need to shelve the wildcat. This is Connor Shaw time. Given the game situation and the magnitude of the game, I can’t think of a better play call in the Spurrier era. The only thing that even comes to mind is the Newton-Boyd-McKinley-Newton play against Kentucky in 2006, but that was a game between two pretty average teams. Last night’s call was simply brilliant. Spurrier’s simple on-field post-game responses to ESPN were also a thing of beauty, as well as his taking a moment to pose for a “five” photo. Orange turnover. I hope Brison Williams, Chaz Sutton and Kaiwan Lewis all got game balls last night. Williams’ interception kept Clemson from taking an early lead and the momentum. Sutton’s play was arguably the play of the game, as the Tigers were driving for the potential tying touchdown when he simply took the ball from Tajh Boyd. Finally, Kaiwan Lewis forced the second fumble of the night from Clemson punt returner Adam Humphries which led to the final score of the night, giving the Gamecocks a much-needed two-score advantage. Shaq attack. Shaq Roland keeps getting closer to being our go-to guy. He only had three catches for 40 yards last night, with one for a touchdown. He had one long catch taken from him after a review (a rip-off IMO) and had another great catch nullified by a defensive pass interference call that gave the Gamecocks a first down. Here’s hoping by this time next year we’ll be talking about him in the same breath as guys like Rice and Jeffery. Wild Wild East. Congrats to Missouri, they certainly earned the division title. Wishing them good luck next weekend. Bowling. As of this writing the new BCS standings are not out, and we’ll have to wait until some conference championship games are played next weekend before we know where we are headed. The most likely destinations look like the Capital One or the Outback, with the Cotton and Chick-fil-a still possibilities. I know there are some who are not in favor of the Cotton, but unless it’s a personal thing (would travel to Florida but not Dallas) I’m not sure what the objection would be. A match-up against 11-1 Baylor on January 3 would be a fantastic showcase for our program. I’m not sure another trip to Orlando or Tampa against a plodding Big 10 team really gets the blood pumping any more. Clemson vs. top-20 defenses: 339 yards/game, 15.5 points/game, 0-2. Clemson vs. bottom-100 defenses: 535.7 yds/gm, 45.1 pts/gm, 10-0. Look, the Tigers played a damn good game last night, probably the best of the last five against us. Their defensive front seven stopped us like no defense has done all year. But you are only rarely going to win a football game when you turn the ball over SIX times in a game. To those Clemson fans who claim they “gave” the game to us, let me tell you a little something about football – turnovers, like those who commit them or force them, are part of the game. You have players who make plays and players who make mistakes. The last few years Clemson has made a lot more mistakes than us, and has had players make fewer plays than us. Wide receiver throws an interception? How about not have your wide receiver throwing passes when you’re moving the ball fine without any trickery. Punt returner fumbles? How about put a guy back there you can depend on. Quarterback gets stripped? How about credit the guy on the other team making a great play and blame your quarterback for not doing a better job of protecting the ball. Punt returner gets stripped? Maybe you should have learned your lesson and put somebody else back there after his first fumble. Quarterback throws two more interceptions? 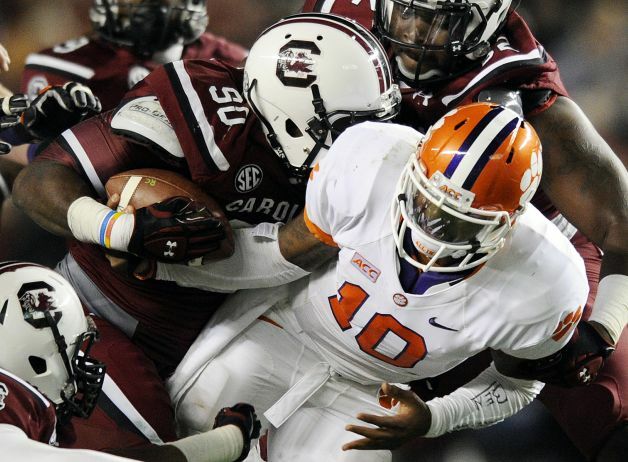 Well, that’s just Tajh Boyd against South Carolina for you. All those things are part of the game and help determine which team is better than the other. And all those things are why Clemson has now lost five games in a row to South Carolina. another great snap judgment! always good reading, thanks! Had one Clemson fan at my work already say that Clemson beat Clemson and it was not South Carolina who beat Clemson. He is doing a Dabo and saying, “Look, we play again and I bet we win because we had the better team on the field. Everyone in WB Stadium knew that including the Gamecocks themselves. South Carolina was lucky to win the game.” He went on to rant that South Carolina will be dominated by Clemson next year. Okay. Heard that five years now. The fact is that South Carolina won the game. 31-17 speaks for itself. I agree 100% with you, that turnovers are part of the game. Ironically, Clemson fans were tweeting last night that the Gamecocks were more excited to beat Clemson than win the SEC East. That is not completely true but it sure did help once we realized Mizzou was going to the title game. We are a great team! That is wonderful to say. I figured if the ”taters” didn’t win this one, they are really gonna be disappointed the next 3 – 4 years ! ! ! ! ! ! + !